Net metering enables solar homeowners to balance their energy usage by exchanging energy back and forth with the electric company, usually for a credit. Net metering is a very useful tool to have when going solar. While it is possible to design a solar energy system that matches your monthly energy needs, the chances of your system over or under producing electricity may occur. The energy output of your system not only depends on the equipment you are using; but the weather, time of year and day, season and so on will affect your electric generation. The good news is that residential and commercial solar system owners can benefit from both over and under production if they are connected to the grid and are signed up for net metering. Keep reading to find out how net metering can benefit you. Simply put, net metering acts as an additional monthly solar incentive that allows you to send excess energy to the grid for the purpose of energy storage. Excess energy can be produced by your solar energy system during peak sun hours, when little electricity is being run during the day and so on. Any energy your system is producing that you are not using is then sent into the grid. Grid-tied homeowners benefit from their connection to the grid when the solar array is under-producing, (i.e. nighttime), in this environment the home’s energy comes directly from the grid. Additionally, homeowners can store energy during high producing months such as summer and apply their accumulated credits during winter months, effectively negating part or all of their energy bill even when the sun is not shining. Solaris Tip: Utilities will often provide net meters, however you can also choose to purchase your own meter and/or purchase an inverter with revenue grade metering (RGM) such as the ones manufactured by SolarEdge. How does Net Metering helps solar system owners? One common misconception about net metering is that you will receive a check from the energy company for the excess energy you produce and don’t use. Instead of working on a cash-based system net metering usually deals in credits. Meaning that utilities will commonly reimburse you for the energy you send to the grid through energy credits, which can be helpful when offsetting energy bills in the future when the amount of energy you pulled from the grid is greater than what your system produced. In most states utilities will carry credits from one year to another if your solar energy system produced a great deal of excess energy. With proper sizing of your system your solar array should be balanced with what you contribute to the grid and what you receive, but it is best to know how your utility works with net metering. Solaris Tip: Net metering is not offered for systems that are working in off-grid environments. However, the above chart does reflect load considerations that off-grid owners should think about when sizing out battery banks. Although net metering does not directly put money in your pocket, California public agencies and schools reported savings of $2.5 billion in electricity costs over the next 30 years due to net metering. Sizing out your solar energy system to work with utilities and seasonal fluctuations in energy use can save you a great deal of money over the lifetime and bring down your overall ROI period. In this sense, net metering and solar work together to save you money and power your home as efficiently as possible. Does my state offer Net Metering for solar? Likely yes, however net metering laws and regulations vary greatly from state to state, utility to utility, and so on. It is important to contact your utility prior to any solar installation to ensure you fully understand their net metering policies. For help getting started check out our net metering guideline by state below. 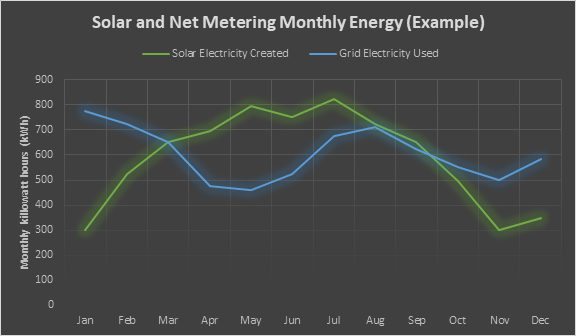 Is Net Metering worth it? Net Metering offers a number of incentives for home and business solar owners whose aim is to stay tied to the grid. Due to the wide range of offers and incentives from the numerous utilities in the United States it is important to check in and ask them what criteria you need to meet to turn your solar energy system on. Overall, net metering does provide benefits when going solar through credits when tied with the grid.